Not having to deal with paper (and that infamous homework-eating dog) was a time saver to Classroom’s beta users, who reveled at being able to grade work as soon as it was ready. 'If a student handed in an assignment early, I could grade and give feedback as they finish. It actually took the ‘man, my grading pile is so overwhelming’ feeling away,' praises Heidi Bernasconi, a biology teacher at Clarkstown Central High School North in New York." As I research and write Teaching Machines, I’m struck by how much of the history of education technology from the early 20th century onward is concerned with the very things this Edsurge excerpt exults: long-running efforts to automate assignments and assessment, for example. These are frequently framed as "labor-saving” advancements for teachers, who as psychologist Sidney Pressey wrote in 1926, are “woefully burdened by such routine of drill and information-fixing. It would seem highly desirable to lift from her shoulders as much as possible of this burden and make her freer for those inspirational and thought-stimulating activities which are, presumably, the real function of the teacher." The irony seems to be lost on Pressey, no doubt, that the drudgery of repeated grading and testing was a result of the very practices that he and his fellow psychologists had promoted. The irony is still lost on many folks today. Pressey’s machine was about the size of a typewriter — the prototype was actually built from typewriter parts — and contained a window through which a multiple choice question could be viewed. On one side of the machine were four keys, and the person using the machine pushed the key corresponding to the correct answer. If set to the “test” mode, the machine would record the correct responses; if set to the “teach” mode, the machine would not advance to the next question until the person got the answer right. We can see in Pressey’s machine one of the early attempts to automate the practice of standardized testing, a practice that had already become routine in schools by the 1920s, expanded from earlier IQ testing initiatives and a real reflection of the spread of science and scientific management into American institutions, including schools. Pressey, quite cleverly but in the end unsuccessfully, identified a market for ed-tech as a result. 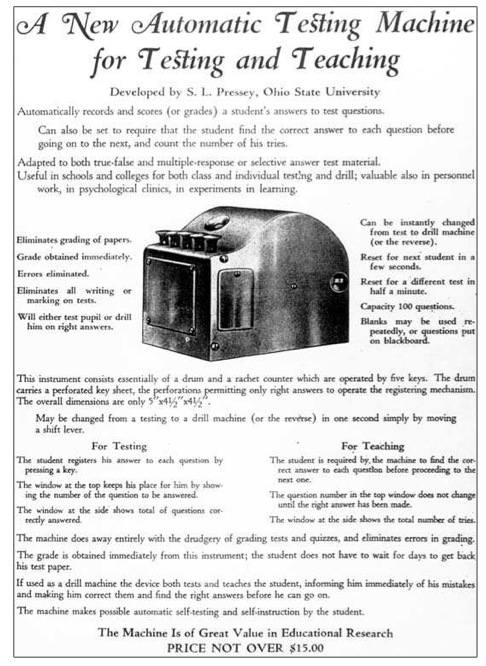 In Pressey’s teaching machine, we can see too how, and perhaps why, multiple choice — prototyped by Thorndike and applied on a larger scale by Frederick Kelly in 1914 — became such a popular format for assessment. Four keys. Four choices. Five keys. Five choices. Multiple choice questions were initially designed to eliminate educator subjectivity during assessment; automation made the elimination of the teacher in this process even more stark, even more "efficient." It’s important to remember here — and looking too at the Google Classroom launch with a grading scale based on 100 points (a grading scale that is not "natural," that has a history) — that technology does not simply work in the service of supporting educational practices. Technology shapes, limits, steers those practices, and then — and this is key — even when the technology changes, those practices endure. They become “hard coded.” They become part of the infrastructure. So for all those excited today to get their hands on the “new” Google Classroom: recognize that you’re actually adopting some very very old technologies.